Several years ago when we lived in another Southern city, I had a favorite restaurant that I liked to frequent because of the fresh vegetables and salads served there. 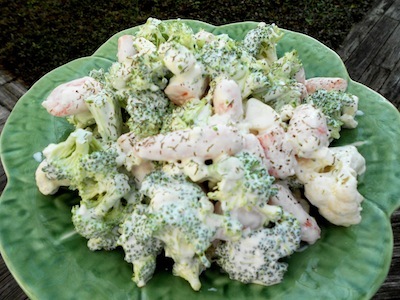 One of my favorite salads at this restaurant was made of broccoli, cauliflower, and carrots with a creamy mayonnaise and sour cream dressing. I was making dinner last night and thought about that salad; how good it would be as a side dish with the chicken and saffron rice that I was making. I also just happened to have all of the ingredients in my refrigerator, so I decided to try to make it myself and I came pretty close. I actually like my salad better because I added feta cheese to give it more texture and bite, and dill to give it another depth of flavor. I hope you’ll like the crunch and the creaminess of this salad. It’s not only good but also, good for you. Please feel free to use your favorite brand of mayonnaise, low fat or not, and you can do the same with the sour cream, especially if you are used to the flavor of no-fat or low-fat. This is good stuff, light or not. Enjoy! Place vegetables in a large bowl. Crumble in feta cheese. In a small bowl mix together mayonnaise, sour cream and dill. Pour over the vegetables and mix to blend. Add salt and pepper to taste. Serves 4. Follow Linda Weiss and Anne K Moore as they blog at Diggin’ It at the Christian Science Monitor website and at their website: The Gardener and the Chef. Linda’s first book, Memories From Home, Cooking with Family & Friends is available at Amazon.com.